Teachers and administrators who share a passion to add technology in the classroom will convene @ the ISTE conference in Philadelphia, June 29 – July 1, 2015 at the Pennsylvania Convention Center, ISTE 2015 will provide tangible resources and hands-on teaching strategies! Teachers will engage with cutting edge companies who offer solutions to introduce STEM (Science, Technology, Engineering, and Technology education) to students. A+ Mobile Solutions is one of those companies – Booth # 1939. ISTE 2015 is hosted by the International Society for Technology in Education (ISTE) and is globally recognized as the most comprehensive educational technology conference in the world. Visit isteconference.org: to read more! 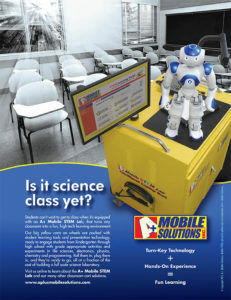 Stop by Booth #1939 and enter to win free use of an A+ Mobile STEM Lab for your classroom! Together, let’s turn your students into scientists! Bay Shore, NY: A+ Mobile Solutions announced today that the Aldebaran NAO Robot and its development software is available as an optional add-on to its Mobile STEM Lab – Intelligent Laptop Cart, adding the ability to teach programming and coding to students of all ages. The NAO robot is the leading humanoid robot being used in research and education worldwide. Equipped with pressure, tactile and sonar sensors, cameras and microphones to perceive its surroundings. "Is It Science Class Yet?" Science Labs in Elementary Schools? Stop by our booth at ISTE, in Philadelphia June 29 - July 1, and enter to win free use of a Mobile STEM Lab for your school!